Will my dog cope with my newborn baby? (Q) I’m having a baby in the spring. What should I be doing for my dog? (A) Battersea canine welfare trainer Nathalie Ingham says: Having a new baby is such an exciting event. However, it’s amazing what a life-changer it is — and from your dog’s point of view, the changes are huge. One day soon, you will dash out of the front door with an overnight bag, so it’s really important to have a plan in place for your dog. Who’s going to look after him? Why not get them to come round and take him out with you a few times so that you (and they) are happy that they know exactly what they’re doing? Teach a reliable ‘Bed’ cue to direct your dog on to a mat. Get your dog used to the baby’s crying — there are plenty of CDs on the market with crying baby sounds to accustom your dog to them. 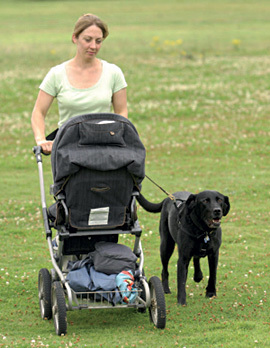 Practise lead walking alongside a pram. You are likely to have a lot of visitors coming round so it’s worth getting your dog used to people, and brushing up on manners such as ignoring all jumping up and introducing a sit when greeting people. If your dog is used to a specific routine you will also want to start changing it, so that a certain lack of routine also becomes routine. There are going to be lots and lots of changes in your dog’s world. To make them as stress free as you can, make sure he is used to as many of them as possible before the baby arrives. For more information about Battersea Dogs & Cats Home, call 0843 509 4444, email [email protected], visit the Battersea Dogs & Cats Home website, follow them on Twitter or find them on Facebook. Last PostWhy does my dog always want to play ball?Next PostShould I get one or two dogs?